Christmas has a way of bringing out the best in people, and in many instances it showcases the false sanctimony of the most egregious evil-doers in the world; this year is no different than past years. 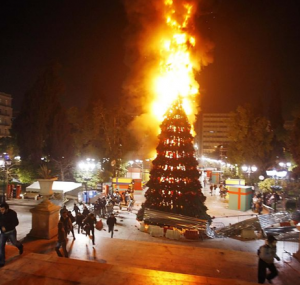 Christians in America have claimed the Christmas holiday season as their time, and they attack any intrusion into their special time with hate and vitriol befitting a raging Satan worshipper. In the Senate this week, Senators Jim DeMint (R-SC), Jon Kyl (R-AZ), and Mitch McConnell (R-KY) invoked their deep Christian beliefs to protest working through the holidays to finish Senate business before the next session in January. It may truly be their desire to be home praying and reading the bible on Christmas, but ever since Jim DeMint admitted that he is just “running out the clock” as a stalling tactic until the next Congress, it is unlikely that their religion has anything to do with working at Christmas. DeMint said that Reid and Democrats pushing the START treaty and Omnibus spending bill through Christmas was sacrilegious and disrespectful because Christmas was one of the two most important holidays for Christians. What DeMint didn’t say is that Republicans have stalled and obstructed Democrats for the past year on every bill before them or Reid wouldn’t have to schedule Senate business over the holidays. Senator Kyl made it sound as if Reid is attacking people of the Christian faith by scheduling the Senate to return to work the week after Christmas like almost every American does every year. Kyl said that Reid is trying to push through an impossible agenda and insults the institution of the Senate, and one of Christians’ most important holidays. McConnell sent Reid an email with a 2004 speech by the late Robert Byrd that bemoaned holding a vote on Sunday. Byrd’s rambling letter claimed that the Senate should honor the Ten Commandments’ admonition to “honor the Sabbath and keep it holy” by not working on Sunday. There are problems with protestations about working up to and after Christmas. America is not a theocracy, and the bible or Ten Commandments are not relevant to the governance of the country. It is true that some Republicans want the Ten Commandments to replace the Constitution, but the 1st Amendment promises the separation of church and state so that won’t happen. So if Kyl, DeMint, and McConnell are such devout Christians, why do their voting records belie their claim that they are followers of Christ? Shouldn’t their single-mindedness of faith permeate every aspect of their personal and working lives? Of course it should, but their hatred for all but the wealthiest Americans is evident that they reject Christ’s teaching and standards at the most basic level. Jesus commanded his followers to sell their belongings and give to the poor (Matt. 19:21), but for devout Christians like DeMint, it is important to deprive millions of unemployed Americans their benefits that employers paid premiums for. Jesus also said that when one throws a feast, they should invite the poor, crippled, lame, and blind because they could not repay them and that their reward would be in heaven (Luke 14:14-15). Jesus’ point was that the wealthy should care for the less fortunate without recompense, but his message is lost on Christians like DeMint, Kyl, and McConnell because they continue giving advantages to the wealthy at the expense of the poor. DeMint, Kyl, and McConnell protect the wealthiest Americans, and in fact, do everything in their power to make them richer. If they were real Christians, they would recall that Jesus said it was nearly impossible for a rich man to enter heaven. So are these Republican Christians deliberately working to prohibit the wealthy in America from going to heaven or are they just hypocrites? Jesus also said to teach a man to fish so he can feed himself. Republicans have made no attempts at job creation or education, but instead have worked tirelessly to help corporations outsource American jobs. To add insult to injury, when Americans’ jobs are lost to China or Korea, Republicans withhold unemployment benefits in a display of extreme hypocrisy and un-Christian behavior. Setting aside the Christian insult argument, there is the issue of Congress getting two or three weeks off during the winter holidays. DeMint, Kyl, and McConnell complain that it’s not fair they have to work so close to Christmas because it offends their religious sensibilities, but they expect Americans to work during the holidays or lose their jobs. Brig. Gen. John Adams said that, “We have one-hundred-and-fifty-thousand US warriors doing their job over Christmas and the New Year; the U.S. Senate should do its job.” General Adams is correct, and 99% of Americans who work up till Christmas would agree that the privileged Senators should not be any different. The incredible hypocrisy of the triumvirate of Christian Senators sends a message to Americans that because they are Senators, they are exempt from the standards Americans face every day. DeMint, Kyl, and McConnell don’t deserve their pay the American people provide because they have not done any work for the past two years. Their constituents expect them to work for the American people, but they have obstructed and voted no consistently and still take their salary. They could have stayed in their home districts and phoned in their “no” votes and saved the taxpayers enough money to provide some unemployed people the benefits they deserve. Americans are seeing the hypocrisy that is prevalent in Republican ranks, and now that they are resurrecting the war on Christians and Christmas, they have a lot of explaining to do. But because they are privileged Christian Republican Senators, they will find new excuses for not working and new reasons to blame their inaction on Democrats because when all else fails, they will thump their bibles, invoke Christmas, and call out Jesus’ name; all because they are hypocrites and want to obstruct a Black man in the Oval Office.